Do I need any special permits or approvals to start an export business in the U.S.? Who can help me with export start-up advice and assistance? Where can I find information on how to export? How can I determine whether to export on my own or use an export intermediary? 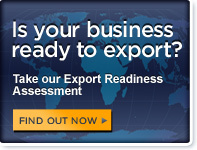 Where can I find an intermediary to handle my export business? Where can I get help with specific trade-related questions? What does it take to be a successful exporter? How can I determine which markets are best for me? How can I identify likely users of my product in specific markets? How can I identify my likely competitors in specific markets? Where can I get advice and information about U.S. export controls? When does a shipment require an export license? How do I get a license? Do I need a license to take my laptop and professional equipment overseas? What are “Denied Persons” and “Denied Entities”, and how do I know who they are? What are the restricted countries where I may not sell my goods? How do I respond to inquiries about my product? How can I attract inquiries/orders from foreign buyers and distributors? How do I respond to a specific trade (offer to buy) lead? How do I respond to a request for a price quote? How can I evaluate prospective agents and distributors? What provisions and protections should I seek in an Agent/Distributor Agreement? How do I get paid for export sales? What are the risks of different payment methods? Where can I find sources of export financing?